"Very easy to use - I didn't need to refer to the manual once. Because you had customised it for the journey I just switched it on, found my destination from the list you had set up and hit go ... I'd have no problem recommending it." "Thank you so much. I'd never have managed without it - particularly from Galway to Ballina." "We travelled through the UK, the Netherlands, Germany, Austria and Italy - we covered over 2,000kms in the two and a half weeks. With the exception of one mistake in Germany we found the sat-nav to be excellent - the voice instructions are great and it always got us to where we wanted." "The satnav was fantastic, very accurate and precise especially when using postcodes." "We have just returned from 10 days holidays in France...we'll never drive abroad without a sat-nav system again - it was great...no arguments ... no fuss. We didn't get lost once, you feel confident when driving and it really does reduce the stress...I'd recommend it to anyone." Garmin In-Car Sat-Nav Hire From €4.00 A Day All In. For trips around Ireland, the UK, Europe, USA or Canada you can hire a top quality Garmin sat-nav system for either your own car or your hire car. A Garmin sat-nav with the latest 2019 maps. Car charger, Carry case, Vehicle mount, A/C charger with Euro/US adapters, Quick guide. 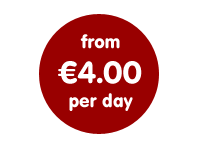 €30* for 5 days and €4* per day thereafter. 'pre-auth' on your credit card taken as security. Late returns €12.50* per day or part thereof. Optional next day express delivery to address in the Republic of Ireland, €7.50. Your contact details including name, postal address and phone number. The start date of the hire and the return date (i.e. the date we will get the sat-nav back). Where the sat-nav will be used - Ireland/UK, Europe, North America. Tell us if you will collect or do you want the sat-nav delivered to you. When you hire from us you accept our terms and conditions of hire.